HIT plays a major role in this approach that relies heavily on clinical decision-support tools to engage patients in the management of their own care. 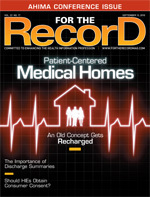 A patient-centered medical home (PCMH) is a model of delivering healthcare that revolves around and engages the patient. It facilitates a partnership between patients, providers, and when appropriate, patients’ family members. The idea originated in 1967 when the American Academy of Pediatrics (AAP) introduced the medical home concept to coordinate the care of children with chronic conditions. All information related to the care of a child was housed in a central repository, and one provider was responsible for overseeing all care. In 2002, the AAP expanded the medical home concept to include the following operational characteristics: accessible, continuous, comprehensive, family centered, coordinated, compassionate, and culturally effective care. By 2005, the American College of Physicians (ACP) had developed an advanced medical home model, which involved the use of evidence-based medicine, clinical decision-support tools, the Chronic Care Model, medical care plans, “enhanced and convenient” access to care, quantitative indicators of quality, HIT, and performance feedback. In 2007, the ACP, the AAP, and the American Academy of Family Physicians joined with the American Osteopathic Association to issue “Joint Principles of the Patient Centered Medical Home” in response to a request from several large employers seeking to create a more effective and efficient model of healthcare delivery. No longer a pediatric concept only, a PCMH now provides care for people of all ages and medical conditions. One challenge to understanding the PCMH model is the term “home,” which is usually associated with a place where patients stay, such as a nursing home. In reality, a PCMH is just a primary care practice. “The PCMH model provides care that is centered on the whole person—more accessible, more focused on outcomes, and more deeply involved in engaging patients in their own management, particularly for chronic illnesses,” says Peter Basch, MD, FACP, medical director of ambulatory EHR and HIT policy at MedStar Health, a nonprofit community-based healthcare organization serving the Baltimore/Washington, D.C. region. • Integrated peer team model: Each patient’s care team is assembled around that particular patient’s needs. • Access: “It’s easy to make appointments, including same-day appointments; expanded hours are available; there is a 24-hour call center; and e-mail and phone consultations are provided,” says Rogers. • HIT: The PCMH utilizes the latest technologies and evidence-based medical approaches and maintains updated EMRs and PHRs. • Patient feedback: The patient experience is measured through surveys and other tools. • Disclosure: The PCMH’s quality and efficiency information is publicly available. HIT is necessary for generating the reports whose data show how to improve a PCMH’s metrics and which can demonstrate that improvement to patients, payers, and employers. • generates lists of patients and reminds patients and clinicians of services needed (population management). She recommends implementing a population registry prior to acquiring an EMR because the EMR’s capabilities should augment the functionality of the registry. The EMR and the registry should be fully integrated, whether through an interface provided by the EMR vendor or a plug-in or patch specifically programmed for that purpose. Other HIT components that increase a PCMH’s effectiveness and efficiency are e-prescribing (one of the NCQA standards) and a Web portal where patients can request appointments, e-consults, and prescriptions and otherwise communicate with their care team via a HIPAA-secure system. NCQA Standard 9, Advanced Electronic Communications specifies the availability of an interactive website, among other requirements. • Boeing recently completed a pilot called the Intensive Outpatient Care Program. It enrolled employees and pre-Medicare retirees and their spouses with the goal of improving quality of care and substantially reducing spending for the predicted highest-cost quintile of the company’s Puget Sound employees and their adult dependents. The project was designed by Mercer Health & Benefits and managed by Renaissance Health in partnership with Regence BlueShield of Washington, Healthways, ValueOptions, and leaders of three physician groups. Each care plan was developed in partnership with the patient and executed through in-person, phone, and e-mail contacts, including frequent outreach by an RN, education in self-management of chronic conditions, rapid access to and care coordination by the provider team, and the direct involvement of specialists. After the first 12 months, functional status scores, Health Plan Employer Data and Information Set intermediate outcomes scores, depression scores, patients’ experience-of-care scores, and employees’ absenteeism scores improved significantly compared with baseline. Compared with a control group of Boeing employees who did not receive their primary care from the PCMH physician groups, unit-price-standardized per-capita spending dropped by an estimated 20%. Qualitative results included the refinement of care managers’ patient engagement skills, more proactive care and care coordination, and more convenient patient access to providers. • Colorado is the site of a two- to three-year multistate, multipayer PCMH pilot that began in May 2009. The PCMH model is being tested in 16 family medicine and internal medicine practices in Colorado and Cincinnati. The Colorado Clinical Guidelines Collaborative serves as the convening organization and provides technical assistance, including in-office coaching, learning communities, and innovative technology. Participating stakeholders include health plans, business groups, employers, state agencies, hospitals, the American Academy of Family Physicians, the American College of Physicians, the Colorado Academy of Family Physicians, and the Colorado Medical Society. Funding is provided by the Colorado Trust and the Commonwealth Fund. • Also in May of last year, the Maine Patient-Centered Medical Home Pilot began as a first step toward statewide implementation of the PCMH model. In this demonstration, the Patient-Centered Primary Care Collaborative is working with 26 participating practices, all the state’s major private payers, and Medicaid to pilot an alternative payment model that recognizes and rewards practices for demonstrating high-quality and efficient care. Success of the pilot will be evaluated by nationally recognized measures of quality, efficiency, and patient-centered measures of care that reflect the six aims of quality care (safe, effective, timely, efficient, equitable, and patient centered) identified by the Institute of Medicine. The ultimate goal is to sustain and revitalize primary care to improve health outcomes and reduce costs. The convening organizations are the Maine Quality Forum, Quality Counts, and the Maine Health Management Coalition. Other participating stakeholders include health plans, several physician associations, Consumers for Affordable Health Care, University of Maine employees, and the Maine Nurse Practitioner Association.